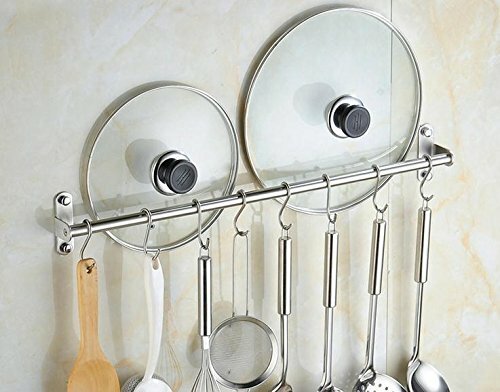 UniTendo Multifunction Towel Rack Hanger Hanging Rack Pan Pot Rack Kitchen Utensils Organizer Racks for Kitchen and Bathroom Accessories in 31'' Stainless Steel with 15 Hooks. 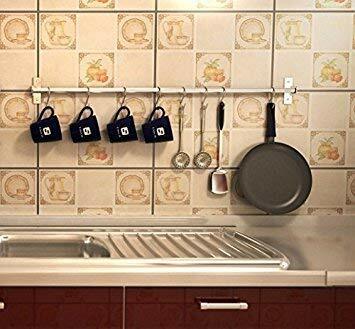 Practical: You can easily store and reach for your cookware; the hooks will stay on the rack when you remove your pans. You won't have to go through the hassle of putting the hook back on the rail each time you reach for your pots and pans. Sturdy: The heavy industrial iron will help you to hang your heavy kitchen supplies as well. 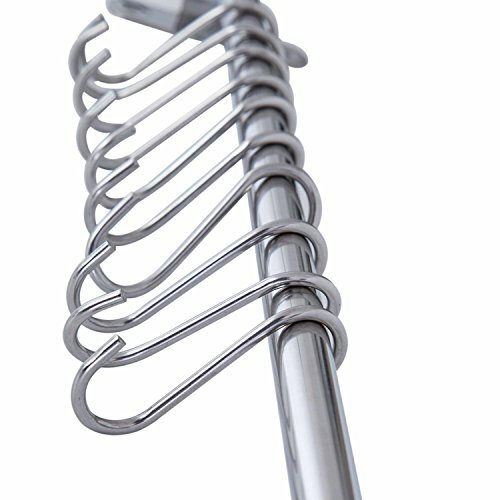 The rack is built to carry a substantial amount of weight, so you can also hang your cast cookware with ease. 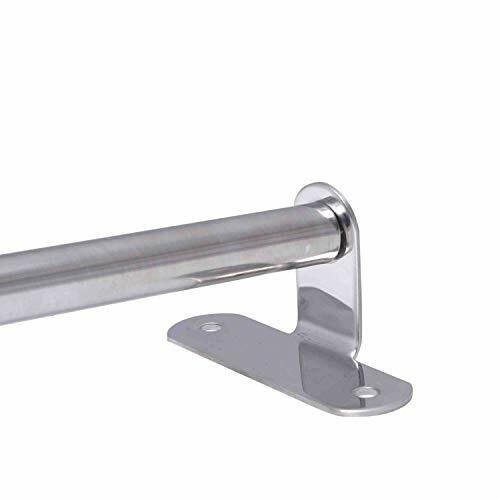 Hefty: For a sturdier construction hang these rails with mounting hardware suitable for your wall material. The Industrial Iron Kitchen Rail Will Help You To: Organize your kitchen, pantry, closets, garage and basement. The wall mounted rails are perfect for hanging just about anything. Hang your pots and pans, utensils, other cooking and baking needs, belts, hats, umbrella's, coats, outerwear, bags, screwdriver, hose, and other hardware. You will feel confident and accomplished every time you walk into a tidy kitchen set-up. 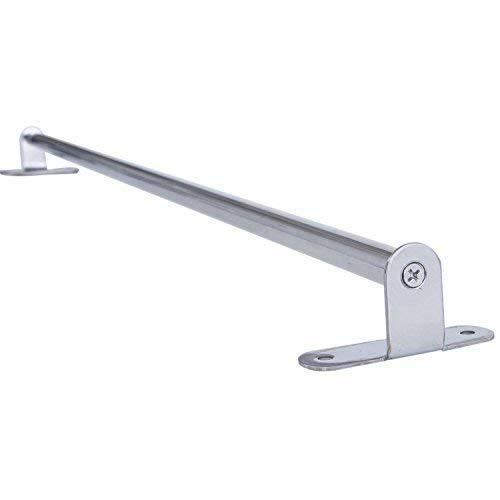 Rail Dimensions: 31" L x 1" H x 1.5" D Each Hook: 3.5"
Material：Constructed by High quality 31" SUS304 Stainless Steel, solid, durable, rustproof, Easily Cleaning. 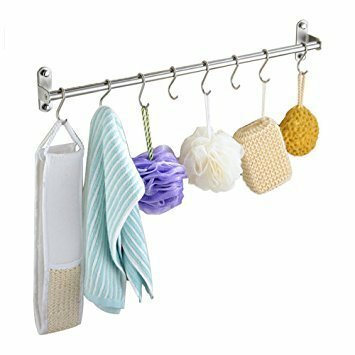 Multi-Purpose: Each wall mount rod and the 15 S-hooks can be used for other purposes, you can hang and organize your towels in your bathroom, bags or hats in your bedroom closet or hang and organize your coats and umbrella's in your entryway, the rail is perfect for hanging just about anything. Design: Brushed surface metal, no fading, more beautiful, easier to clean and protect. Solid bottom panel, stronger hardness, greater bearing capacity, less deformation.One-piece molding, higher density, longer use. 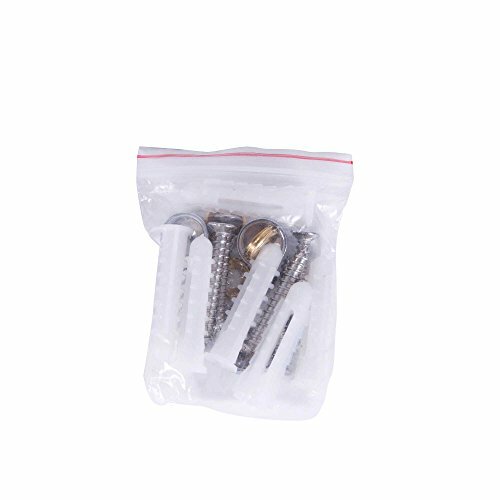 Easy to Install: With the supplied screws, plugs and screw caps, this kitchen utensil rail can be installed in a short time. 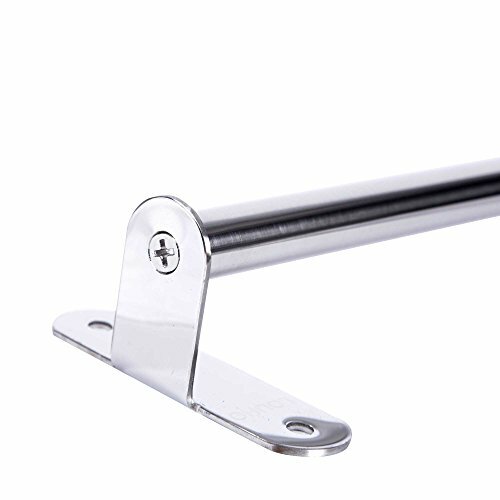 It is convenient to fix the wall hanging rack on the door or wall to free up lots of space. Kitchen essentials: Create valuable storage space and save a whole cabinet space with this rail installed on your wall. No more fumbling through cookware to find the one you need.